A Toshiba laptop running Microsoft Windows 7 with an AMD processor had been working without issue. After updating several drivers, a Runtime Error! message box presented itself upon each reboot, regardless of the power source. 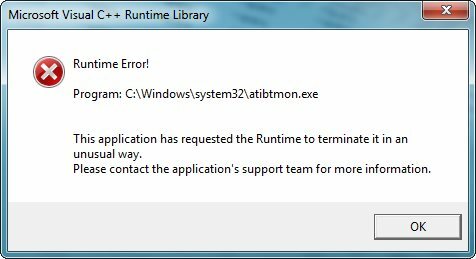 More specifically, a Microsoft Visual C++ Runtime Library error box for the program C:\Windows\system32\atibtmon.exe. 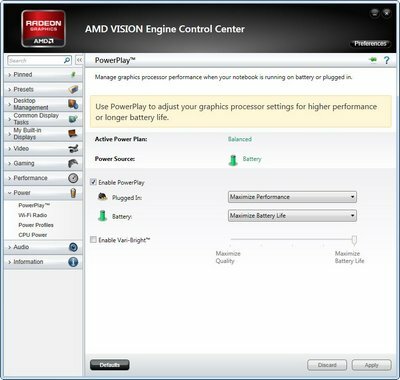 It turns out that the error is a result of a setting from within the AMD VISION Engine Control Center. Screenshot of the Microsoft Visual C++ Runtime Library error box. Runtime Error! Program: C:\Windows\system32\atibtmon.exe This application has requested the Runtime to terminate it in an unusual way. Please contact the application’s support team for more information. To access the AMD Vision Engine Control Center, go to Start and in the Search programs and files box search for AMD. Select whatever the AMD … Control Center that may be installed, in this case, it is AMD Vision Engine Control Center. Go to the Power tab from the left pane and select PowerPlay. In the right pane in PowerPlay, uncheck the Enable the Vari-Bright. After changing this setting, a reboot verified that the error message no longer presented itself. Done. Note: Unlike what many of the websites may indicate regarding operating systems or hardware configurations, it could be as simple as this application alone. ««HP DL380 G3 support for USB 2.0 exists!